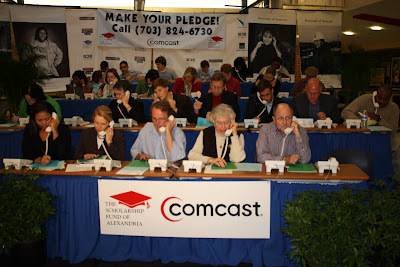 In fact, let's have the 16th Annual Telethon for The Scholarship Fund of Alexandria . This year we are on air Sunday October 25, 4-9 PM. These are pictures from last year. 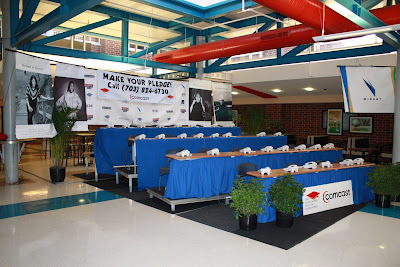 The Scholarship Fund of Alexandria awards graduates of T C Williams High School (remember Remember The Titans?) scholarships for post secondary school education. 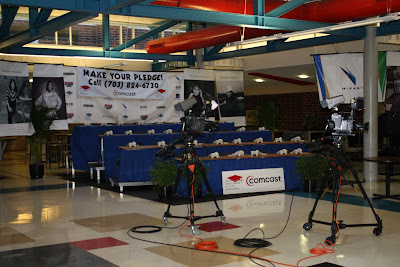 As a part of the fund raising effort we host a Telethon on our local cable station Comcast 71 (and also webcast on the Fund website). 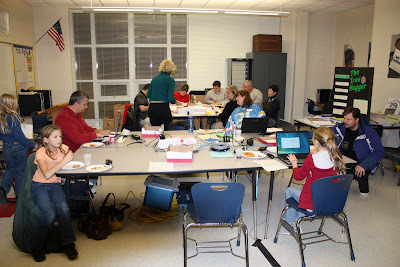 We have the usual phone bank, interviews and check presentations on three sets in the Commons area. Comcast cameras and crews are in this area. 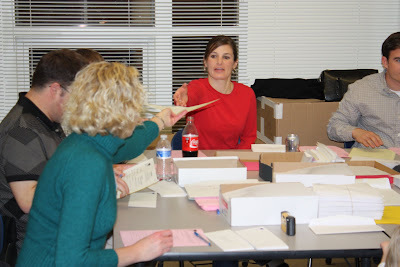 Our hosts include NBC Channel 4 Newscaster Julie Carey (in red). Entertainment is on the main stage. 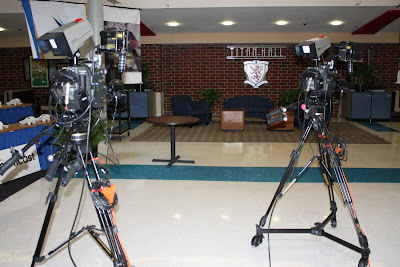 The advanced TV production class students work the two cameras here. This signal goes to the school control room where student directors switch and then send the signal to the Comcast truck parked outside the building. 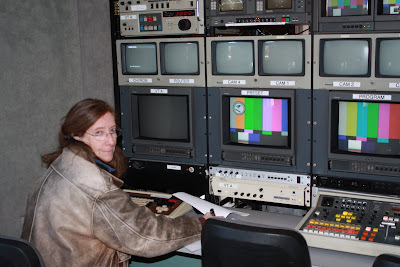 The truck control room calls the Commons shots, combines the TC shots and sends the show to the Comcast head-end to put on the air. Audio comes from the WagTech Sound company who are set up on stage and in the Commons. 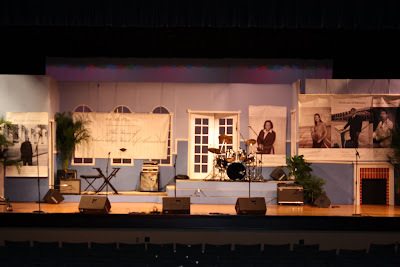 Last year we worked with the set from the fall play which had ended its run the night before. This year the play runs the week-end of and the next week-end so it is a little more complex. This is a community event and takes many hands: from Comcast; the school staff; the city elected officials; the student volunteers from Project Discovery, Building Better Futures, and Key Club; the volunteers who process pledges; the Alexandria Jaycees, community organizations and other service groups; and many, many others of alumni, business leaders, and parents who make the calls to raise the money for the general fund. I'm just the producer (with all the detail work that entails) getting the show on air. As the Annual Report says: "What makes the Fall Telethon a record success year after year? It is the shared belief that all Alexandria students should have the opportunity to pursue higher education and the knowledge that it takes a commitment from the entire community to realize that goal." In 1995 the telethon raised $27,000. In 2008 the Telethon raised $135,000. 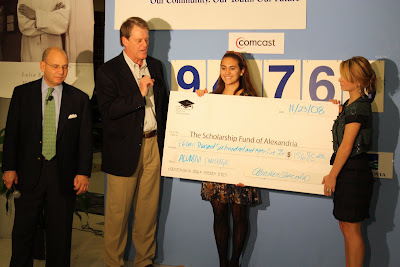 In 2008 The Scholarship Fund of Alexandria gave over $775,000 in new and renewal scholarships. Here are some scenes from this year. In the truck, trying to juggle and cover for a band that didn't show up at the last minute!